One of my resolutions for 2016 is to entertain more at home than I did in 2015. I used to invite friends over 2-3 times/month before I started teaching cooking classes full-time. By the time Friday rolls around, I’m kind of over major food prep. So cooking for friends fell by the wayside. But I realized it’s also one of my favorite ways to spend my time so I need to find a way to bring that back into my life! My goal is to entertain more simply with less pressure to make everything Pinterest and Insta-worthy. Good friends don’t care. I know this is true because when someone invites me over for a meal, I am more excited about spending quality time with my friends than what is on the menu. So for my last blogpost of 2015, I thought I would share an easy, delicious and very popular recipe that might encourage you to invite friends over during the holidays. 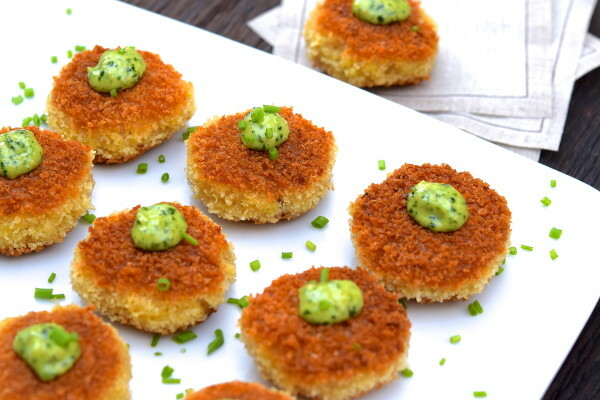 These risotto cakes made an appearance in my Party Foods class last December and I remember the kids hoping there were some extra when they returned home from school. I love it when I have a recipe which is just as popular with kids as adults! 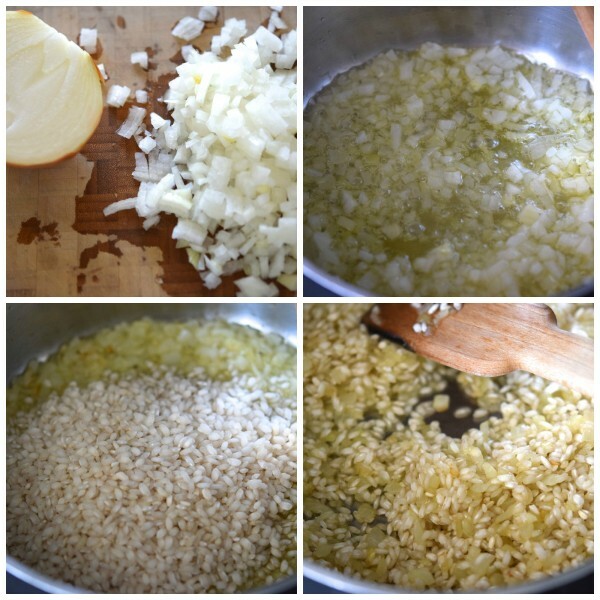 Essentially, you take leftover risotto and form it into a small patty (1-2 bites each), coat that in beaten egg and bread crumbs and saute in olive oil in a skillet. The good news is that you don’t have to make proper risotto for this recipe. No stirring every 5 minutes or standing over the pot. 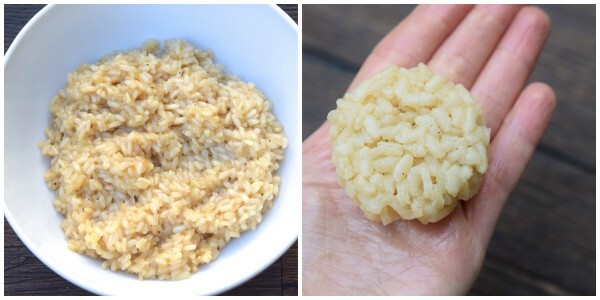 The only goal is to have a cold rice mixture that is sticky enough to form a little patty. I have mixed feelings about rice since there are pros and cons to both brown and white rice (brown you have to soak + contains arsenic, white is lacking the fiber.) So my rule of thumb is that if I don’t have time to soak brown rice, I go with white. But I’m sure you could make this with short grain brown rice and just cook it for longer. Either way, you can make the rice today, form the patties tomorrow and saute them before your friends come over on New Year’s Eve! Keep them warm in a 250 degree oven for up to an hour if necessary. What’s also nice about these little cakes is that you can eat them plain or top them with any number of toppings from store bought tapenade to pesto aioli (shown here — nothing more than pesto mixed with a little Vegenaise) to sautéed mushrooms or garlicky greens or a tomato compote. You can also make them bigger and serve with a green salad for brunch, lunch or dinner. A poached egg on top would round it all out. Heat 2 Tablespoons of olive oil in a large heavy-bottomed saucepan over medium heat, add the onion and cook until softened, about 5 minutes. Add the rice and 1 ¾ teaspoons salt and ¼ teaspoon pepper and cook, stirring often, until rice starts to crackle, about 1 minute. Stir in the wine and let simmer, stirring often, until completely absorbed, about 1 to 2 minutes. Add all the stock, stir to combine and bring to a boil. Reduce the heat to medium low and simmer uncovered, stirring occasionally, until the rice has absorbed the broth and is cooked through, about 10 to 12 minutes. When the rice is done, taste for seasoning and remove to a large bowl and let sit until cooled to room temperature, about 40 minutes. Cover and refrigerate until completely chilled, at least 2 hours or overnight. When risotto is fully chilled, place the eggs in a shallow dish and beat with a fork. Set aside. 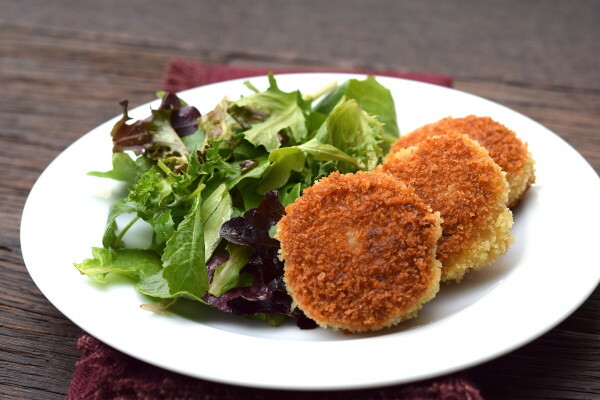 Place the panko bread crumbs in a second shallow dish and set aside. 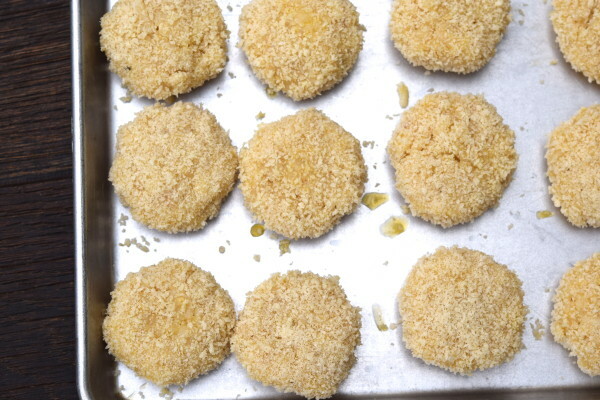 Measuring about 2 Tablespoons per cake, form the risotto into small, round 1 ½ inch patties. If the risotto is sticking to your hands too much, moisten them with a little water. If the rice isn’t sticky enough and the patties aren’t holding together, squeeze the rice in your palm a couple of times until it sticks. 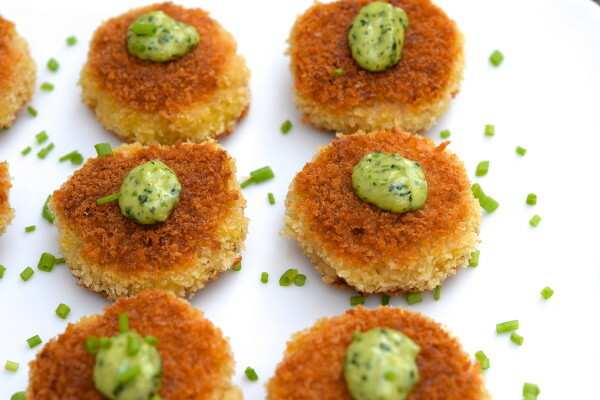 Working with 1 risotto cake at a time, coat it with egg, letting any excess drip off, then coat it evenly with the panko, pressing gently so the breadcrumbs adhere. You can do this in the morning and refrigerate until ready to sauté. Heat a large frying pan over medium-high heat and add enough olive oil to generously coat the bottom of the pan. 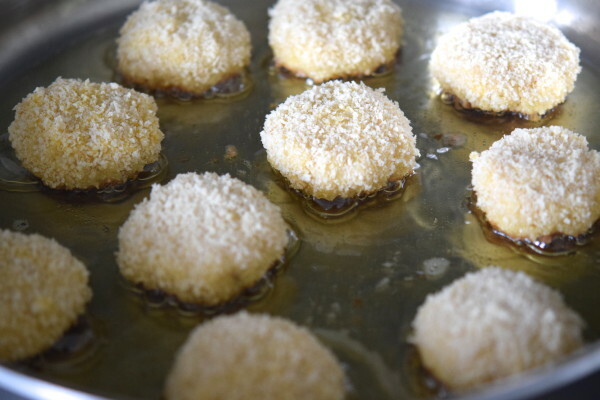 When the oil is hot, add the risotto cakes and fry until golden brown, about 2-3 minutes. Flip and continue cooking, adjusting the heat if necessary, until golden brown and heated through, about 2-3 minutes more. You can keep the cakes warm in a 250 degree oven on a baking sheet if necessary or transfer to a paper towel lined plate. Serve hot. You can also add sautéed kale or spinach to the risotto before cooling, or sautéed diced mushrooms. You can serve these with a little pesto or pesto aioli, warm tomato sauce or a red pepper sauce, whipped goat cheese or sautéed mushrooms on top. I served your mini risotto cakes as part of a Sunday brunch, and my guests inhaled them, even people who normally do not enjoy rice dishes. As always, your recipe was right on target . . . . texture, taste, timing and even the suggested toppings. Once again, thank you for all your wonderful recipes and entertaining suggestions! You never cease to amaze us! Great idea to serve for brunch! Thanks, Mia! Looking forward to your Sunday post! Thanks for all of the great recipes and inspiration! Happy New Years!